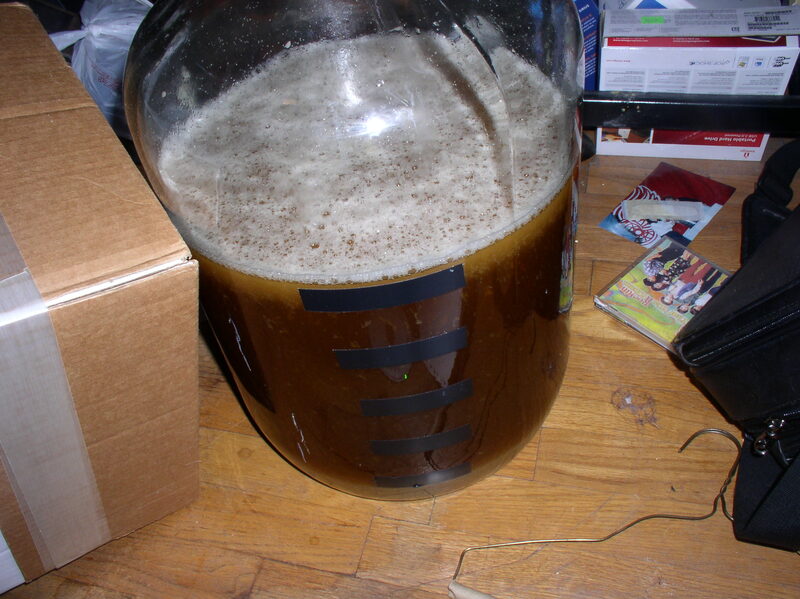 Jeff & I have brewed numerous gallons of beer together–there was the batch that went wrong and we ended up using as lawn fertilizer, there was the batch where we forgot to add half of the extract and the batch that ended up…smelly. Okay so those were the bad batches…the rest were great. But they had one thing in common–they were all made from extract. 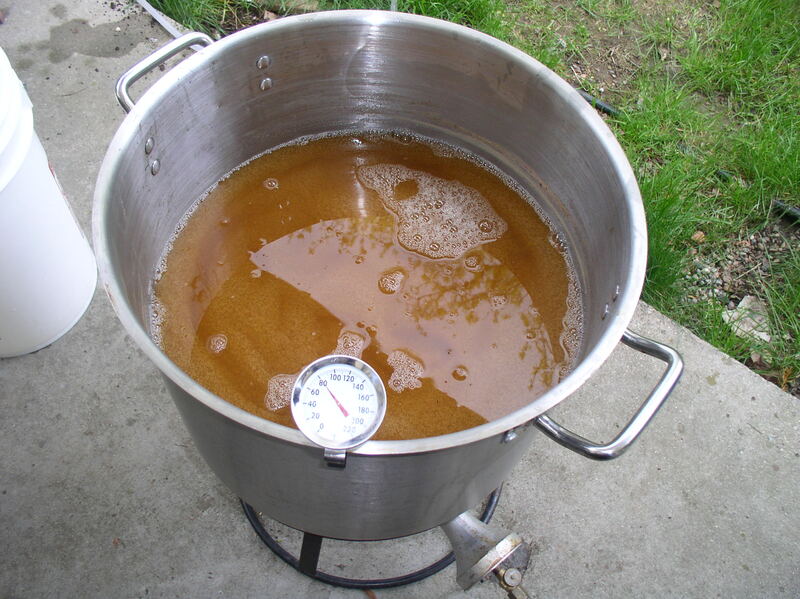 There is nothing wrong with brewing using an extract. It just means that all of the sugar has been extracted from the malted barley before you even start the brewing process. When you brew using all grains, you have to extract the sugars yourself. We decided to try the all grain brewing process with an India Pale Ale called “Hop Scram” (which I kept calling “Hop Smoosh”, despite Jeff’s best efforts to school me on this). Jeff bought this at the awesome Adventures in Homebrewing store. Here is a picture of the 14.5 pounds of barley that we started with. The first thing that you must do before brewing is CLEAN. If your equipment has any goop on it, your entire batch can be ruined. So Jeff cleaned and cleaned and even cleaned our sink which was nice. Then after you clean, you sanitize the equipment. I wasn’t lyin’ about this cleaning stuff, was I? Start about 4 gallons of water a’boilin’ in a large kettle. Next, you put that water into the large yellow container, which is called the mash tun. Then add the grains. This is called “doughing in”. Let the grains sit in the hot water in the mash tun for an hour. This is called “mashing”. 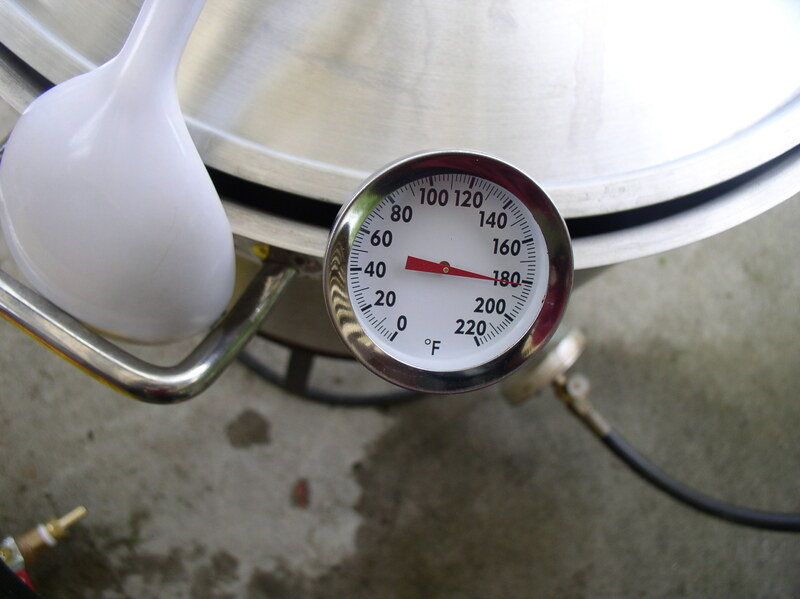 While the mashing is going on, heat up 5 gallons of water (in the kettle) to about 200 degrees. After the hour of mashing is up, you will use this new hot water to rinse the grains that are in the mash tun. I don’t have pictures of this because I had stepped out to go to a Lady Food Blogger event. Oops. Anyway, you simply pour the hot water into the mash tun and drain the water out of the bottom. (There is a special apparatus that allows for this technique. 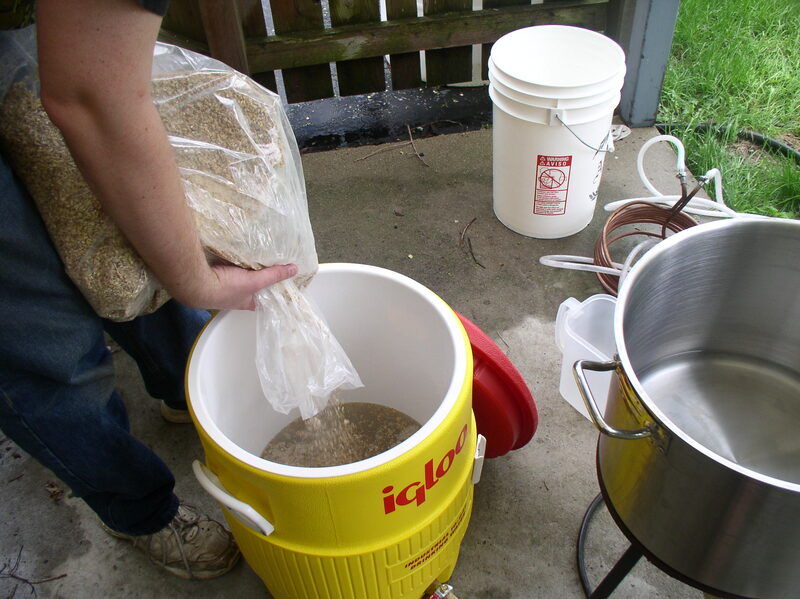 The rinsing technique is called sparging, which is one of the coolest brewing terms, IMHO). Remember that water that you are draining out? It is called wort. It is the sweetened water. Make sure you catch it in a pot or else it will just flow all over your patio and unless you dig licking your patio, you’re in trouble and have no beer. Take the pot and return it to the burner. Bring it to boiling. Add the hops per the recipe. In our case, we had Cascade, Centennial and Columbus. (Hee hee, we had that “fine Columbian…makes tonight a wonderful thing!”) Let it boil for an hour, or per the recipe. Like magic!! Look at it go! Now we must add the yeast. 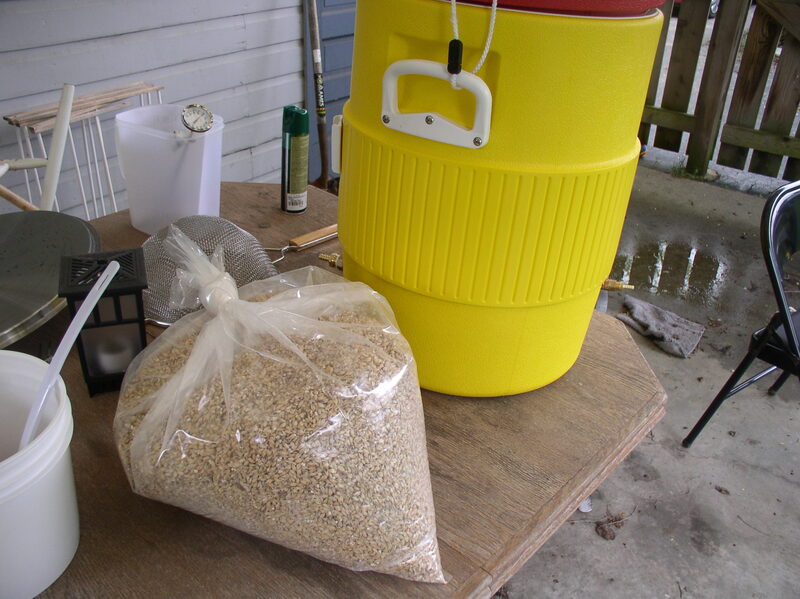 We get the yeast in cool bags that puff up and then we cut and then we pour the magical yeast into the carboy. Mmmmm. 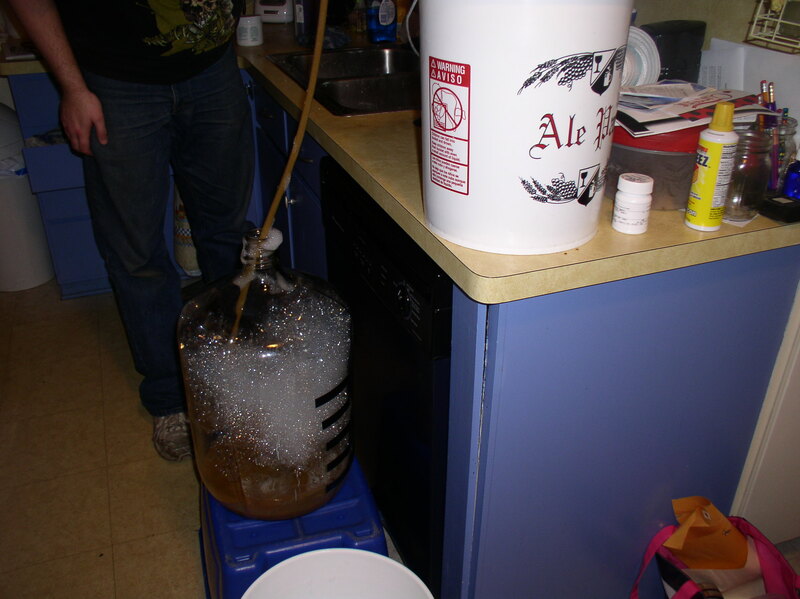 You then have to add oxygen to the beer which you can do with an oxygen tank thingie unless that thingie has no oxygen in it and then you kind of agitate the carboy and hope for the best. 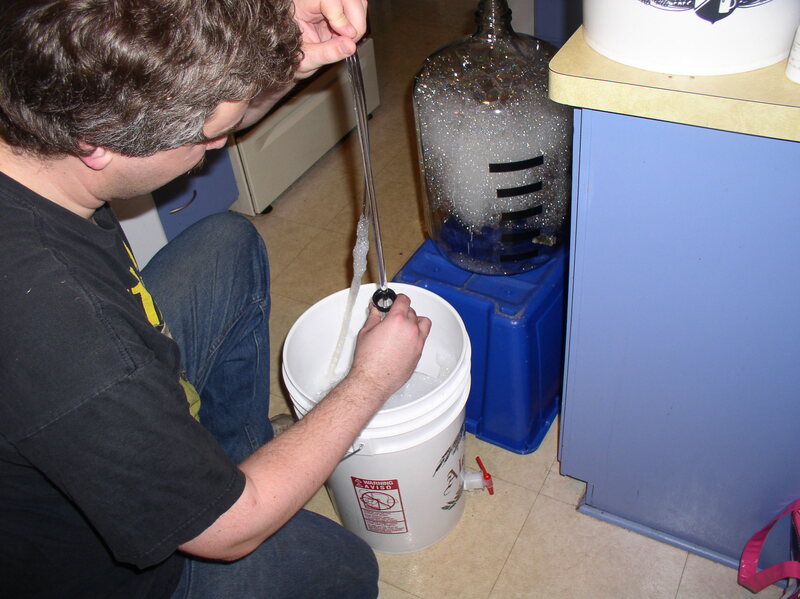 Now you must put the lid on the carboy–remember to clean and sanitize it first!! 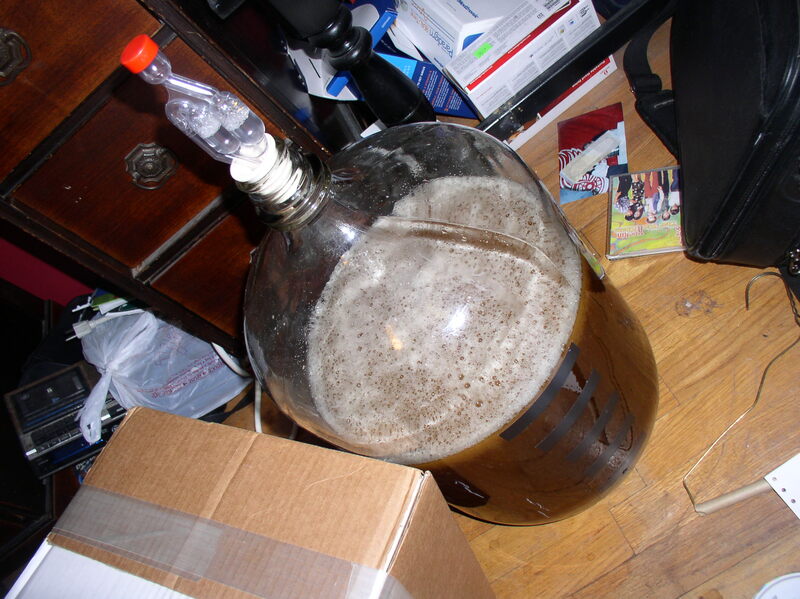 Then you can put the carboy into a cool, dark room. You can see it here, living in our spare room. Why, yes, those are CDs, pictures and broken clock radios that you see in the background. Cuz that’s how we live. Take copies and send it back to the homestead and show ’em how we live up in here. Now we have to wait…about 3 weeks in the case of this beer. At that point, we will put it into our CLEAN and SANITIZED keg, give it some CO2 and then wait about a week. After that, the sky–errr, 5 gallons of it anyway–is the limit! Next Can I Make Your Garden Grow? fun! Our brew days usually involve a lot more beer and a lot more men out in my garage LOL.